I took the photo above during our first visit to Las Vegas, Nevada. This is one of the coolest hotels I've ever seen in my life. 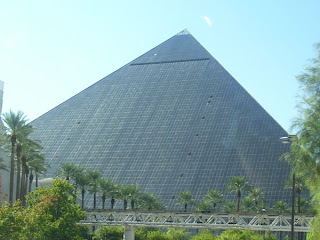 The Luxor Las Vegas is a hotel and casino located on the Las Vegas Strip in Paradise, Nevada. It was one of the city's first fully-themed mega-resorts. Ground was broken for the Luxor in 1991, that same year construction began on the Treasure Island and the current MGM Grand. It has a pyramid and modern motif and contains a total of 4,407 rooms lining the interior walls of a hollow pyramid and contained within twin ziggurat towers that were built as later additions. The hotel is named after the city of Luxor (ancient Thebes) in Egypt, the site of the Valley of the Kings, Karnak and Luxor Temples, and scores of other pharaonic monuments—but no pyramids.